One of my favourite things about LUSH is that their skincare range is so versatile, it's really easy to build yourself a routine that works perfectly. I always try my hardest to properly remove my makeup and look after my skin in the evenings, so through a little trial-and-error of different products I came up with a routine that both suits my skin type and isn't a massive hassle to stick to. When it comes to toners, there's only one for me. Breath Of Fresh air is my absolute go-to every night for removing the last traces of makeup and cleanser from my skin, and when used with cotton pads it doesn't leave any sticky residue behind. I am however really intrigued by the LUSH Dream Steam toner tab, so I may be trying one of those next. To keep my skin glowing and to remove the top layer of dead cells, I love to exfoliate my face with Ocean Salt. It took a while for me to figure out which version of the scrub I needed as it comes in four different varieties (alcohol free, self-preserving...) but for me the original, coarser Ocean Salt is the perfect exfoliator. This past Summer I was so into the new jelly masks! I own both Bunny Moon and Birth Of Venus, and whilst they're both absolutely lovely, now the weather is getting colder I like to use a thicker, more nourishing mask. For this I choose Rosy Cheeks as my weekly face mask and it's truly a treat on an otherwise depressing Sunday evening. I actually got very lucky with moisturiser as I absolutely adore the first LUSH one I ever tried. 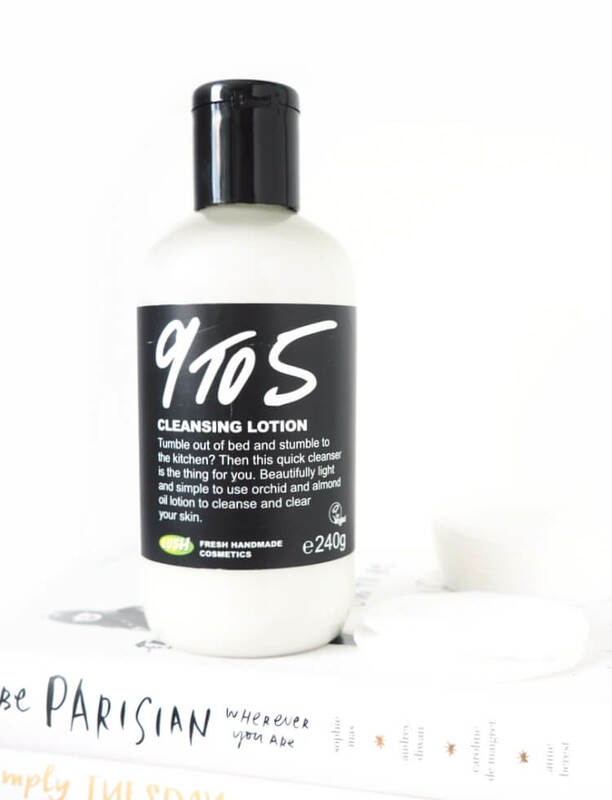 I am currently using Celestial which smells exactly like the 9 To 5 due cleanser to the dove orchid ingredient. With this moisturiser a little goes a very long way, which is good as it's bloody expensive. I then moisturise my entire body with Sleepy body lotion as I start to transfer from my skincare routine into my bedtime one. What products are in your skincare routine? Hi, i love the LUSHTOBer tag, I do like Lush but tend to have bath products, maybe I shpould try their skin care products but I always stick to Dermalogica. I'm so glad you enjoyed #LUSHTOBER! Caught red-handed! I'm the biggest LUSH-raver going! I'm rather lazy when it comes to skincare routines. It generally just involves Lush's Ultrabland (to remove makeup) and then Celestial (to moisturise) and that's it. Very boring, I know. ;) I'm trying to re-introduce face masks in there and Rosy Cheeks is definitely on top of my list after I tried it once.... This post just really makes me want to go raid a Lush shop right away! Ultrabland is lovely! I bought my sister it and stole a few uses out of her pot. Rosy Cheeks is very good, and I'd definitely suggest trying a sample of a jelly mask! I love reading about other people's skin care routines especially with Lush products. I've only just started trying to figure out my own routine so I found this interesting and really helpful in how I can organise my own routine. I haven't gotten a chance to try Lush skincare products, but now you make me really want to go for it! You definitely should, they're all amazing! Wow my skin is feeling really crappy after reading this as I don't actually have a skincare routine (whoops). The rosy cheeks face mask does sound - and dare I say it - lush! Your skin always looks amazing in your photos, so you're definitely doing something right! So, What Happened To The LUSH Kitchen?